Girl Kuripot Girl Kuripot: Girl-Kuripot Raffle Giveaway - 100 Free Large Milk Teas from Bubble Tea Greenhills! Thank you for supporting Girl-Kuripot's Giveaway! As some of you may know, my main blog is the travel blog Guiltless Getaways. Getaways can be short or long as long as you go somewhere that comforts you. You can make the most out of traveling, sometimes without spending much, but it requires effort and some luck. Here, you'll always find contests with travel-related prizes, good deals, my other interests and my stand in life. I am very happy to announce that I will be giving another freebie! Girl-Kuripot can be your gold ticket to that getaway somewhere in the metro! Clue: It is still related to traveling because it's a foodie adventure to the newest place in town! It's the perfect giveaway for Girl-Kuripot. Most of all, there are 100 slots to give away so here's a chance to spend the day with your friends and family! Joining the raffle giveaway won't take 5 minutes. If you still haven't joined the Meyerf Travel Pack giveaway (last day November 20, 2010! ), click here. 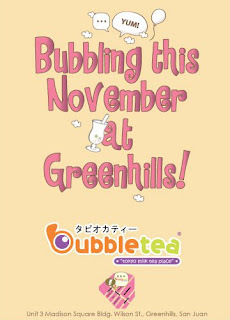 The Prize: 100 (ONE HUNDRED) Free Large Milk Teas From Bubble Tea Greenhills up for grabs! "Bubble Tea is a Japanese themed restaurant that offers Japanese fusion comfort food. Dishes are all time favorites and work well with milk tea. 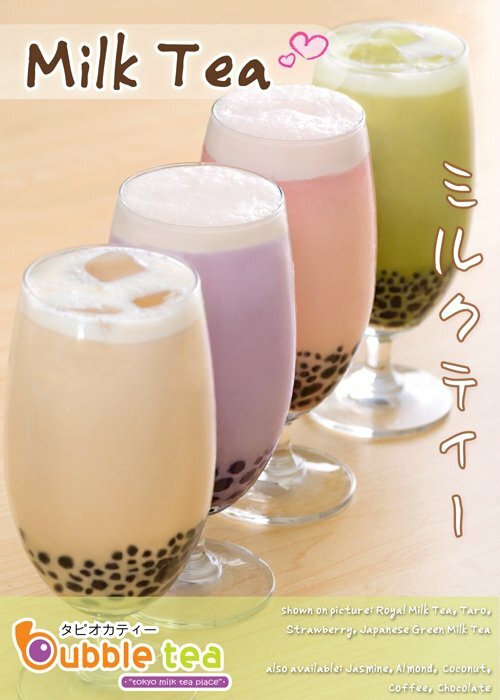 Many of Bubble Tea's dishes are unique and are only available in Bubble Tea." In Canada, Milk Tea is popularly known as Bubble Tea. 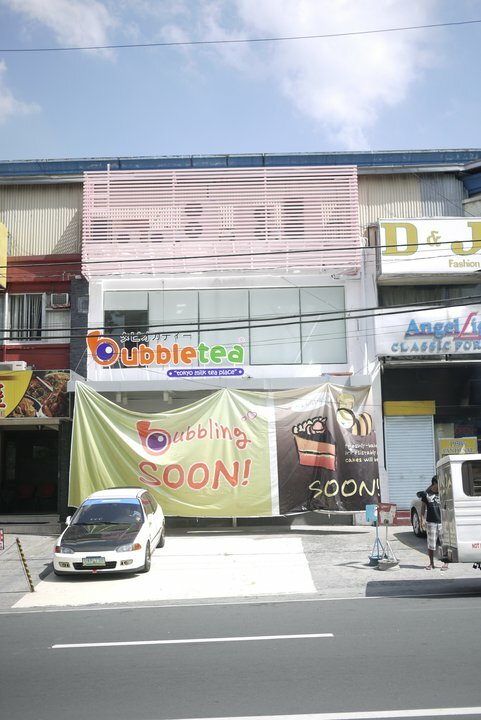 Bubble Tea Restaurant is opening their newest destination in town - Bubble Tea Ortigas in Greenhills Wilson Street! You can now enjoy your Bubble Tea in a full-scale restaurant that serves good food with a cozy and homey ambiance. The place has WIFI for its diners and ample parking spaces too. Winners can claim their Free Milk Teas according to the Batch Time Only. Those who qualify for this raffle giveaway can only register once so choose a batch wisely! If you are a winner, you can claim by showing up at the specific time and date of your batch and present a valid ID with picture in Bubble Tea Greenhills! Ask your family and friends to join this giveaway and they might just win a Free Milk Tea too. I always want to make this raffle giveaway simple for all of us. Step 1 - Like "Bubble Tea Restaurant, Manila" and Post the exact message (tag Bubble Tea Restaurant, Manila) below on your wall. Step 2 - Fill up the entry form completely. Only 1 entry must be submitted per person. 1. Log into your Facebook account and "like" Bubble Tea Restaurant, Manila". HOW TO TAG: Type in the "@" symbol then follow it with the word "Bubble Tea Restaurant, Manila". This will prompt a drop-down menu box which will present you " Bubble Tea Restaurant, Manila". Click that and you should see the "Bubble Tea" become a blue link. 3. Finally, change the privacy restriction to "Everyone" by clicking on the lock icon just left of the "Share" button. 4. One entry per person ONLY but you may repost or reshare it as much as you can. Fictitious accounts will be disqualified. 5. To check if your entry is valid, you should be able to see your message post on the Fan page wall of Bubble Tea Restaurant, Manila. 6. Fill up the entry form completely. Only 1 entry must be submitted per person. 8. Those with correct and valid entries will be included in the electronic raffle draw using Random.org. 9. Winners will be informed via email and will also be announced here. 10. Prizes can be claimed according to Batch Date & Time in Bubble Tea Greenhills after you present your valid ID with picture. Bubble Tea Milk Teas are made fresh daily so it may take longer than usual to make your special milk tea. Mechanics seem familiar? You know the drill! Winners will be announced on November 11, 2010! Special thanks to Bubble Tea and Boy Kuripot! Bring your cameras and join their current contest too - Go Pichur! Pichur! at Bubble Tea and win a camera! 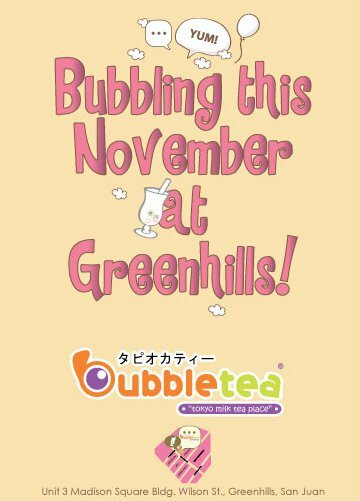 Here's An Exclusive Sneak Preview of Bubble Tea Greenhills - Only in Girl-Kuripot! Facebook name: Fatima carla Sison. my FB name: Fatima Regine Sison. royal milk tea is my favorite! i hope me and my sister wins! Japanese Green Milk Tea for me..
Taro Milk Tea, please. Thanks! FB Name: Robert Sarte Jr.
FB Name: Robert Sarte Sr.
Taro Milk Tea Pleez! 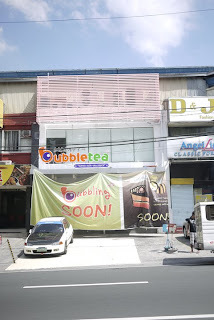 I'm Sooo Near Bubble Tea Greenhills. Perfect for after school snack! Japanese Green Milk Tea !! Anything Japanese I like!!! Strawberry Milk Tea for me! Honeydew Melon Milk Tea for meeeeh! honey dew melon milk tea ako. paborito ko ito! Royal Milk Tea! Like it so much!